kb: As White, I must say that this game was really lost in the first 20 moves of the opening. This kind of game is very rare (most amateur games aren't this way) and may be difficult to fully explain, but it really is my feeling. However, I must commend both sides for playing a high-quality game otherwise, it was very fun to take part! This is the most typical result. Black turns to the left side next. Dave: Basically is an overplay. The 2-space jump from a pincer is normally the starting point for a counter pincer (at a later in the game). This is a powerful approach when White has some stones in the upper right. 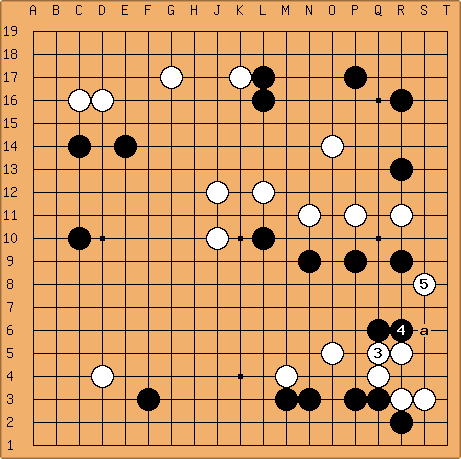 Alternatively, in pro games we can see this when the upper right is a Black stone on 4-4 (Black is hampered by the 3-3 invasion aji). However, we do not see any examples where the upper right is a Black shimari (in GoGoD circa 2008 at least). Simply put, the reply at b, played in the game, is too favorable for Black. White gives Black solid territory in both the lower right and upper right. The attack on the original Black 3-space pincer stone can not be severe enough to provide adequate compensation. More typical would have been a play at c, for example, instead of . unkx80: was played at a, and this move definitely cannot be labeled as a bad move. But I would very much prefer to approach the corner rather than the lacklusture a, because a does not place any pressure on any White stones and effectively allows White to decide how he wants to play on the left side, whereas approaching with is Black making the choice instead. If chooses not to pincer, then makes a high extension, making a better high-low balance than playing at a followed by approaching at . Further, as a running fight is anticipated after White b, having both and as compared to only Black a helps Black somewhat, because the running fight is concentrated more towards the upper half of the board. If makes a pincer, then I anticipate this sequence. here is definitely not the only move, but it is one that exploits the low position of the stone and indirectly helps the stone as well. For the low pincer at , Black also has the option to play this joseki if Black does not like White to have a wall facing the right side. This wall indirectly helps as well. tapir: Black has 10 stones on this board, white 7. No wonder the black formation looks better. unkx80: Add more White stones as you wish. Just add the same White stones in the diagram below. I'm comparing this diagram with the diagram below. tapir: I understand this, but as Black can't play 4 times in a row he won't get both of those marked stones. I wonder whether you can compare two unrealistic results to determine whether one stone is better placed at an adjacent point. On the other hand, having played low gives Black no good move when he wants to defend the two three-space extensions. If Black plays the stones, then it leaves behind the excellent reducing move at a. On the other hand, having the stones at the b points make Black's position look incredibly inefficient. unkx80: Not exactly. Playing at D10 has the same weakness of playing it at C10: it gives White the option what to do on the left side, i.e., approach from the top or the bottom. Actually, between C10 and D10 I would usually choose C10, but that's mainly personal preference. My point was really is better played by approaching the top. Part of the reason the unique position on the right side, with R9 being a six-space over-extension awaiting a White invasion. The formation on the left side is actually secondary, but it occurred in the game so I mentioned it as well. Finally, it should be commented that should be played on the left side. If Black plays at on the right side, then makes the sanrensei with extension on the right side. Then would be forced to invade, possibly at a. In this situation, Black would have given White the control of the game, which is undesirable. I understand much of the above are very subtle to kyu players, and the differences are actually quite small, not really significant enough to affect the win-loss outcome of the game. Of course, not everybody necessarily agrees with me, but this is what I think anyway. kb: I agree with everything unkx80 says in the above comments. Right on. Dave: Black is more likely to slide at . Since the lower left corner is White, the attachment at is the most common continuation. Dave: If Black wants to avoid the attachment above, the 2-space extension at is available. In reply to , if Black plays at a, White will pincer at b. So instead, Black most often exchanges for and then extends to . Dave: The natural play for is the extension from the top shown here. The left side is not symmetrical due to the marked stone at on the upper side. Therefore White should respond to Black's invasion immediately. If Black extends to , White invades and the fighting starts. This is a standard idea. kb: unkx80 is correct as always - is much better at b. As it happened in the game I think White had many chances to capitalize on Black's "mistake" but this is something that is pretty difficult to explain. I'll try anyway. ;) From a general perspective, Black playing at both and a makes Black behind one step in the center. White's one-point jump looks great in the circumstance, and is starting to look even a little heavy. Let's look at the follow-up. There are three moves that can really put the pressure on Black here, namely a, b and c. The former two are a type of probe and can work in tandem with the stone if Black answers incorrectly (which is also really difficult for us amateurs!). 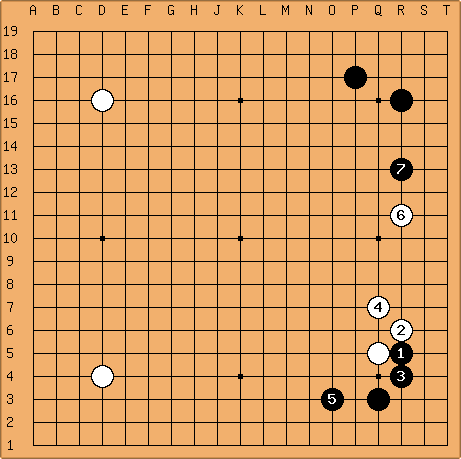 If Wa and Black blocks (to the right), then White has gained on the outside, and may consider continuing by attaching on top of , settling his stones easily. Afterwards, and might become a target. If Black answers differently, Wa may become well-placed to threaten to settle White's running group by cutting off . Wb is pretty standard and is useful here after Black has already played ; Black would again really like to play one to the right of a to more strongly attack the outside White stones, but if Black answers there then White can live in the corner later. Wc is much better than in the game. In the game, White jumped out and Black jumped out too - it's like Black played first! White gained nothing - actually, White lost a lot, because White's group does less work because of Black's strong group in the corner and Black's group makes the bottom two stones look a little uncomfortable. tapir: While White c was not, b was proposed by Andy. I move like a would not occur to me til now, but I see the attachment at works better with it in place. Much better is to play like this - attack with the knight's move. 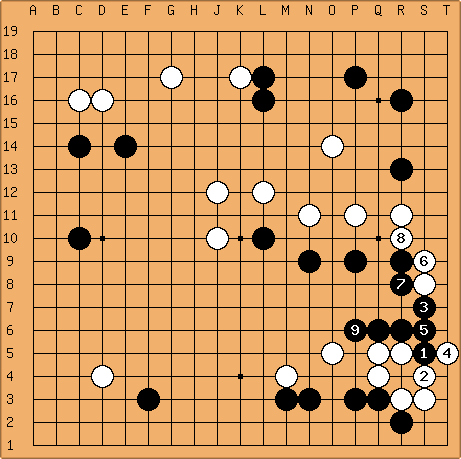 White gains some central influence (which might work well with ), while Black must run to safety. Unfortunately, Black gets a valuable move at , so White must respond with and settle the weak White stones in the corner. This looks decent for White and is better than the game. However, there is an even better way. As White here, after Black plays jump I want to immediately switch (right English word? Chinese is 转身) to here. How strong! Whether Black defends or resists, either way White can build influence, and then attack as the previous diagram. Black's attack with is unsatisfying as the White stone can run away, and allowing is way too painful. So Black must play differently on that side. tapir: Can anyone stronger comment on White 24 and 26? Was this inevitable after the marked black stone or are both moves a little inefficient in handling the situation (as I suspect)? Andy: and are so submissive that I essentially gave up on the white team after these moves. unkx80: I sort of expected to be at either or a.
Herman: Yes, I think is too slow. I didn't like much, but if white chooses to respond with , it becomes a good move. After , white has already spent a move to secure their group, and shoul;d not be spending yet another one on it. So I think should be at the top side star point. I think this result was horrible for white. As it was stated on the White discussion page, White's only asset in the game now was the weak black group in the center. So white ignored the marked stone in order to attack with the marked white stone and - and just like that, Black settled his weak group, in sente nevertheless. Game over. What happened? tapir: How weak is the black group? It has always the possibility to connect at S11. Was it really necessary to protect the cut? If white plays here, black has no base, and a cut now seems a bit of an overplay. The marked stone is not important, and with the black group being as weak as it is, I can't really imagine getting captured. Black is the one who's in for a tough fight, and while he struggles for life, white should be able to build some important thickness in the center. If White does protect the cut, the hane at (a) at least seems terrible to me - it just helps Black form eye shape. here is one idea. It can't be cut off, and now Black is again without a base. He can probably build one eye to the left of , but he'll have to scramble for another. unkx80: Then I imagine a sequence like this. Now White can make only an eye in gote in the corner. I think White is worse off in this diagram than in the game. unkx80: Remember that about twenty moves back and made the and exchange? The main reason why I said that is painful for White because it makes the exchange look pretty bad. Consider a tewari analysis where we remove the and stones. Black still plays at , White , Black , all of which are pretty natural moves. Will White now play at or a? unkx80: If is played as shown, then it induces the natural hane at the head of two. Then how is Black supposed to find eye space for the dragon? Black will not be willing to shrink himself by playing at a or b. Black c will be answered by d, and still leaving the aji of White clamping at e.
When I selected at , I envisioned an almost guaranteed eye around a. Even if we discount the possibility of connecting underneath at f, I think it's almost impossible to kill - I feel that another eye at d and e are more or less miai. unkx80: I see your point, didn't really think about this . unkx80: I wanted to play here as shown, because it is a simple move that (i) works well in combination with the stone, and (ii) it prevents the very annoying White a which I have no good answer for. Part of the reason for (ii) is because I am quite reluctant to sacrifice the stones, especially when White has not yet played at b, is because the White dragon is not yet fully alive, which we can exploit using a wait-and-see approach. And I thought that is entirely natural after .